Framsden Village is 10 miles (16 km) north of Ipswich and 3 miles (5 km) south of the small market town of Debenham, Suffolk. The B1077 runs through the west of the Parish and the A1120 cuts across the north of the Parish. The majority of homes are situated along Framsden Street with smaller clusters at Peats Corner, along the A1120 and St John’s Row in addition to more scattered houses towards Otley and Cretingham. There is also a significant number of more remote farmhouses and tenant farms of the Helmingham Estate. 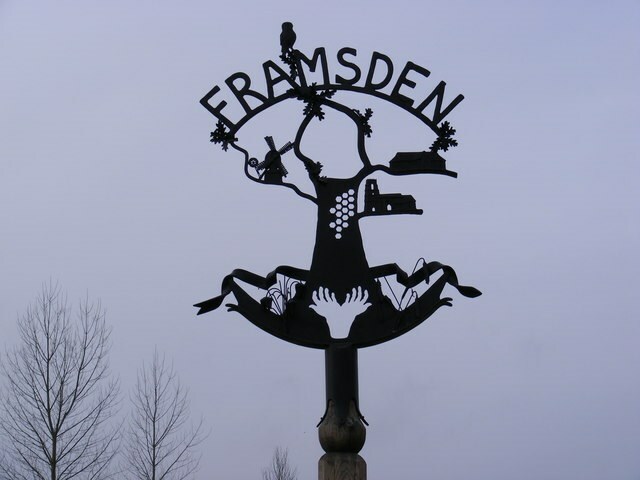 The total population of Framsden in the census of 2001 was 299, with 125 households, 52 people under 16 years, 201 of working age and 46 over 65 years. Framsden is mostly within the Helmingham Estate and a lot of property is tenanted. These are traditional estate 2 bedroom cottages or large farmhouses which are sometimes rented as temporary accommodation. The village is surrounded by arable farmland but enjoys one of the greatest lengths of public footpaths (around 16 miles) for its size and has conservation areas of ancient meadow and veteran trees.